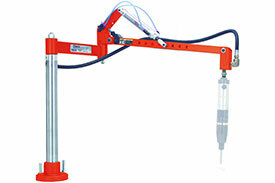 Cleco Pnuematic Air Cylinder & Spring Balance Arms feature ball bearing construction. Cleco Pnuematic Air Cylinder & Spring Balance Arms support tools weighing up to 5 lbs. for the Spring Models or up to 10 lbs. for the Air Cylinder Models. 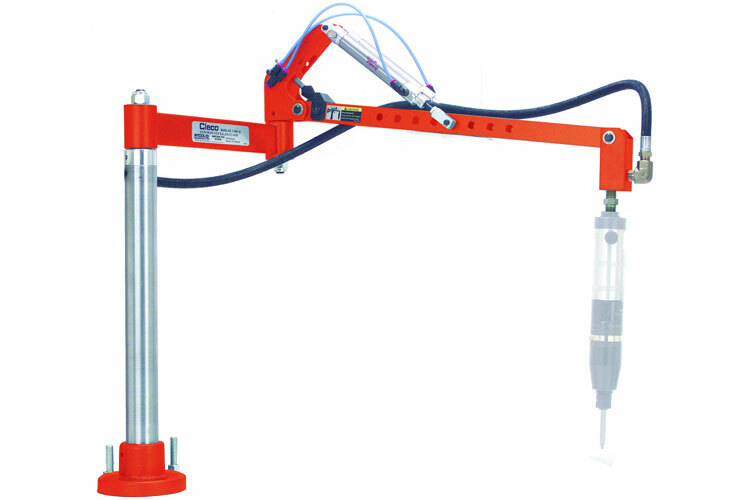 Cleco Pnuematic Air Cylinder & Spring Balance Arms also feature post, wall, or adjustable height post mounting, and are available in single or parallel arms. The 520160 Cleco Pnuematic Single Air Cylinder Balance Arm is one of thousands of quality tooling products available from MRO Tools. Please browse Cleco Pneumatic Single & Parallel Air Cylinder Balance Arms for tools similar to the 520160 Cleco Pnuematic Single Air Cylinder Balance Arm. 520160 Cleco Pnuematic Single Air Cylinder Balance Arm description summary: Cleco Pnuematic Single Air Cylinder Balance Arm CSBA-18 Ordering Number: 520160 A: 12'' / 305mm B: 18'' / 457mm C: 18'' / 457mm Quantity discounts may be available for the 520160 Cleco Pnuematic Single Air Cylinder Balance Arm. Please contact MRO Tools for details.